SEATTLE – Scott Hatteberg didn’t make “Moneyball” a best-seller, and the book didn’t make Hatteberg a star. Except perhaps in his own clubhouse. 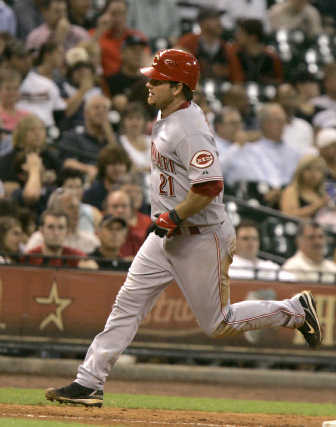 Within the closed society of the Cincinnati Reds, Hatteberg knows he sold at least one copy – to teammate Adam Dunn. “So he could read the chapter on me and make fun of me,” Hatteberg said. Of course. What better target of derision could there be than the ultimate example of hard work, adaptability and measurable statistical skill? Overlooked – predictably and properly so – on a weekend given over to the celebration of a homebound superstar was the return to the neighborhood of a survivor who owes his career to the counterintuitive wisdom of baseball’s most influential innovator, and to his own spirit. Where the old motto “Be Kind, Rewind” applies just as well to the former Washington State University catcher’s career – now in its 11th major league season. It could be going better in the won-lost column where the Reds are, along with Kansas City, the worst team in baseball. But at age 37, Hatteberg is still the Moneyball Kid from Yakima, doing the same things that made him the apotheosis of Oakland general manager Billy Beane’s baseball heresy. B) The Flat Earth Society, Joe Morgan sergeant at arms. Hatteberg was worth his own chapter, titled “Scott Hatteberg, Pickin’ Machine” – which described how Beane plucked a spent backup catcher off the discard pile and turned him into a bargain first baseman. Hatteberg perfectly fit the A’s hitting model, which prizes on-base percentage, few strikeouts and wearing out opposing pitchers with patience and extended at-bats. This was in 2002, or about the time Hatteberg thought his worth might be spent. The Red Sox knew it, too, and traded him to Colorado. The Rockies, looking at a $1.5 million arbitration tab, offered him a third of that and then granted him free agency. At the same time, the A’s had the notion of him replacing Jason Giambi at first base. So for $900,000, Beane got himself a first baseman who couldn’t play first base. Hatteberg set about fixing that – starting with his wife, Bitsy, hitting him fungoes, the story Dunn has mined most often for his clubhouse cutting up. When spring training arrived, the duty fell to Ron Washington, now the Texas Rangers’ manager but then the A’s infield coach. Meanwhile, Hatteberg honed the hitting style the Red Sox did their best to quash. That first season with the A’s, he led the American League in first pitches taken – an esoteric stat, to be sure, but not an irrelevant one. His on-base percentage – .374 – was 19th in the league. The ride in Oakland would last four years – Beane re-signed him to a two-year, $4.65 million contract in 2004. At which point he became too rich for the A’s way of business. With Cincinnati, Hatteberg’s batting average (.292 this year) and OBP (.389 last year) continue to climb, and his strikeouts continue to drop. But he makes it clear – he owes his career resurrection to Beane and the A’s. In that respect, he’s his own sequel. Moneyball, indeed.